In a country like India that depends heavily on rain-fed irrigation, the southwest monsoon has always been critical for the agriculture sector. Conditions were relatively favourable this year (June-September 2017), leading to a cumulative rainfall that was only 5 per cent below the long-period average or LPA. Most parts of the country received normal-to-surplus rainfall while the regions with deficient monsoon rain - Punjab, Haryana, and parts of Uttar Pradesh (UP) and Madhya Pradesh (MP) - could fall back on the irrigation network. However, excess rain over the period and consequently, floods, led to huge crop loss in several states, including Tamil Nadu and parts of Andhra Pradesh, Gujarat and Rajasthan. There came a hint of the possible outcome on September 25 when the Ministry of Agriculture released the first advance estimates of major kharif crop harvest. According to government estimates, total foodgrain output in the 2017/18 kharif season is likely to reach 134.67 million tonnes compared to last year's 138.52 million tonnes, a dip of 2.8 per cent. Rice production is likely to fall by 1.91 million tonnes; production of maize may go down by 0.52 million tonnes; oilseed production could be lower by 1.72 million tonnes, a 7.7 per cent drop from last year's 22.40 million tonnes, and pulses may fall by 0.72 million tonnes. So far, sugarcane is the only crop likely to witness a significant growth - an estimated 337.69 million tonnes against last year's 306.72 million tonnes. Former agriculture secretary Siraj Hussain is hopeful, though. According to him, the late revival of monsoon rain in the southern states is good news for farmers as better residual moisture will help them at the time of sowing rabi crops. "As for Punjab, Haryana and Western UP, the rainfall had been lower than average. So the residual moisture would also be lower for the rabi season. 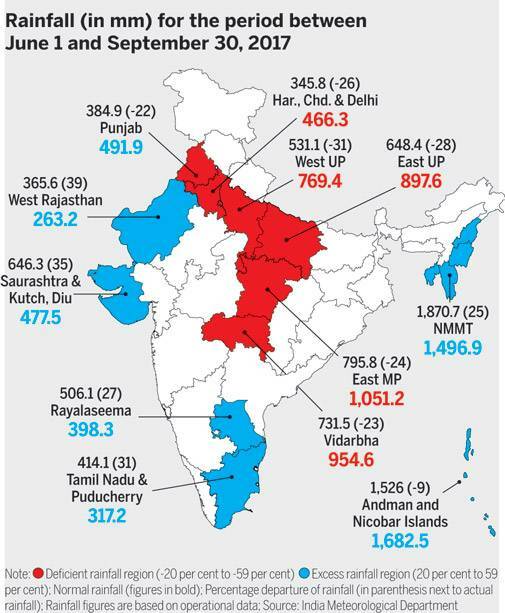 These regions have adequate irrigation facilities, but it also means farmers will have to spend more to avail those. Although the rabi crops may do well, income could be adversely affected depending on total production," he adds. Hussain says (better) production makes more sense when seen in connection with the overall impact it will have on consumer-end prices, leading to higher price realisation. While it is too early to predict retail prices, higher production does not necessarily ensure proportionate benefits for Indian farmers. "I have just been to Kota mandi (wholesale market for agro products) and found that soybean production is higher than last year. But prices continue to be lower than the minimum support price fixed by the government and no procurement has started," he says. The bottom line: Governments cannot do much to control monsoons or natural disasters. But they can play a key role to make sure the prices farmers get would keep them in business in the long run. The real challenge here is to ascertain how farmers may get remunerative pricing.